Come and grab a little slice of heaven in Stevenson Ranch! This amazing pool home sits on a corner lot and boasts a fantastic floor plan, 3 car garage/man cave,upgraded flooring and so much more! The kitchen features a huge center island, granite counters, dual sinks, dual ovens, and opens up to the dining nook and family room. All 4 bedrooms are upstairs, as is a loft perfect for a second family room or play area. Inside you'll find many details like built-in cabinetry, a whole house fan, granite counters and lots of cabinetry/storage in the garage, custom drapes, and more. Outside you'll fine your own little oasis complete with awesome pool/spa featuring sheer descents and beach entry, amazing hardscape and landscape, low voltage lighting, and an island BBQ complete with misters and wired for TV! 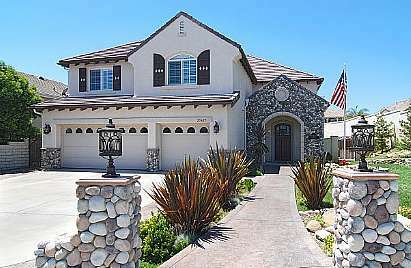 All of this in one of the valley's premiere locations, close to freeways, excellent schools, shopping and restaurants! Put this one on your 'must see' list!